Voted Runner Up in the NKBA Awards 2017 Peers Choice. Clean lines and beautiful surfaces makes this kitchen a stunner ! Our client's are loving the Purecoat product by Laminex ! Our kitchen will feature in the latest Laminex marketing. Look out for it in your favourite magazine or visit our showroom in 2017. Congratulations to our team at Beaver Kitchens. We have taken out two awards at the 2016 NKBA Design Awards this year !!!! It is popular belief in both fashion and the interior design world that hot trends tend to repeat themselves in a cyclic fashion. What might seem outdated today could well be popular 20 years down the line once again. While a natural ebb and flow in styles often dictates what is popular, nostalgia also plays a pivotal role in dictating the direction of what is "in". Retro is making a big come back in recent times as designers are quickly turning towards décor and prints of the past to add colour to contemporary spaces. If you are not comfortable with a dedicated retro theme but fancy adding one or two special pieces try a retro styles Smeg fridge with a matching colour scheme. Many design experts believe modern art deco style is also inherently vintage, as post depression 1930's saw the advent of glossy surfaces and delightful curves. You can borrow elements that fall in different eras ranging from the early 1920s to the late 1980s. Do not worry too much about strict guidelines to era when designing a retro kitchen, playful but functional is the key. It’s an old real estate adage that the kitchen and bathroom are the most important parts of the home. With that in mind it’s important to consider the layout and practicality of your own kitchen. Is it outdated? Is it functional? When looking at building a new kitchen a number of questions will come to min and many decisions will have to be made. From basics such as layout, appliances, productivity and use of space to more subjective choices like colours and handles – the decisions can seem endless. At this point the skills of a kitchen designer should not be overlooked. Their expertise and specialised knowledge will eliminate any costly mistakes and provide you with a set of plans that are custom designed for your cooking and entertainment needs. Remember, ‘ it costs no more to build a well-designed kitchen than it does a poorly designed one’. However when looking at selecting a designer, cabinetmaker or joiner make sure they are a member of the NKBA (National Kitchen & Bathroom Association). This seal of approval ensures you are dealing with a reputable firm who believes in the NKBA principles of manufacturing and design excellence. The Certified Designer deserves your full confidence as certification is based on documented proof of knowledge, ability and experience in design. Furthermore, the CKD must adhere to a very strict code of professional conduct. An ongoing professional development system insures your designer is up to date with the latest products, trends and technical information. If you choose a designer or prefer to go it alone, it still pays to do some research. Look through magazines and collect clippings and brochures for ideas. 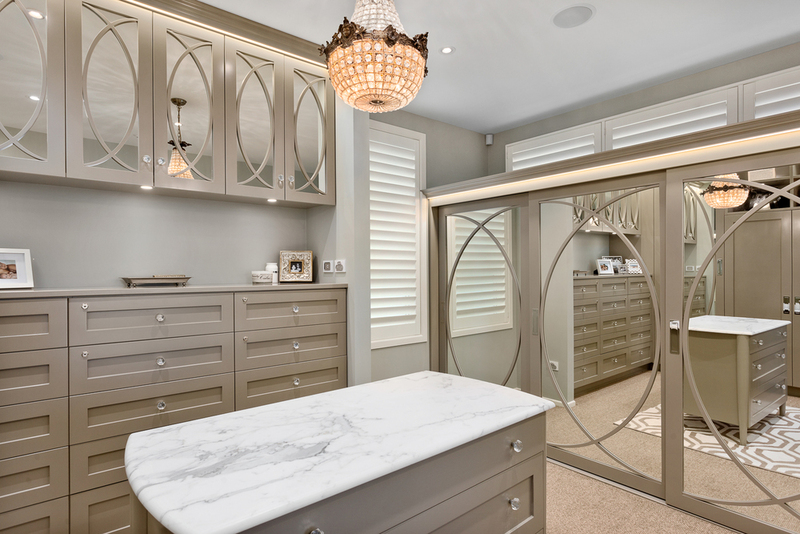 Visit showrooms or home shows and ask questions about materials, storage, hardware features and colour schemes. Consider your everyday needs and lifestyle – do you prefer a sleek, contemporary style or something a little more ‘family’ orientated that is durable enough to survive the tough knocks of young family life? Finally, remember that the key to a successful kitchen is the understanding your designer has of your needs and requirements. Supply them with as much information about your cooking, storage, shopping and eating habits as you can. All this information will ensure you achieve the best layout for your kitchen and lifestyle. To work in a well designed kitchen specific to your needs is a delight and can make family meals and entertaining a pleasure for everyone. From inception to installation we can make your kitchen building experience an enjoyable one and help make any decisions you have a little easier. We also ensure you can envisage your kitchen beforehand with CAD drawings and elevations of your design and three showroom kitchens on display so that you can experience the latest in kitchen hardware firsthand. For many years kitchen hardware companies provided a selection of drawers, hinges and various other pullout hardware systems that designers or kitchen companies selected and specified. To a large degree this still happens but there has been a recent shift where hardware companies are now designing complete storage systems around their product range. A lot of research has gone into the ergonomics of not only the product but it’s position and usage in the kitchen. These types of studies were traditionally undertaken by kitchen designers and applied to the kitchen design as a whole. The companies behind these studies are obviously trying to market more products to the end user but this shouldn’t be seen as a negative. What was usually information that only good, qualified designers had, is now available to everyone. It’s not only available but is also put in a format that makes it very easy to use. Essentially these systems are designed to compartmentalise your storage into different areas, rather than one large pantry or cupboard. You are asked to identify high, medium and low usage items. Then separate them into task specific groups. Based on this information the correct storage hardware can be identified and also the position of that hardware within the kitchen. For example you don’t store your large soup pot that you only use once a year in your pot drawer under the hob. Or alternatively your spices that you use every day should be stored in a spice drawer or rack, where the labels can be read without lifting them out, and within arms reach of the associated appliance eg, your hob. Simple stuff but you would be amazed how often what appears to be common sense is completely missing in some designs. So once you have compartmentalised your items, what hardware is available to store them? For the past 10 years the love affair with the drawer has grown exponentially and the market has driven the hardware companies to release stronger, quieter and more sophisticated drawers. Full extension soft close drawers are almost the standard now, but it’s what’s happening inside the drawer that gets exciting. 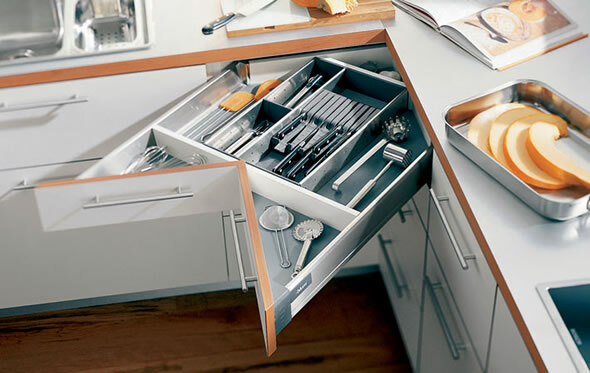 Organiser systems within the drawer have become huge, ranging from your simple cutlery divider to complex plate holders and swing out side pockets. You also have a good selection in product choices, timber, stainless steel, glass and of course plastic. Motorised drawer systems which require a simple touch to open and close, are now common particularly in rubbish bin drawers. Corners have always proven to be difficult to design as access can be difficult and many hardware options required circular shelving. This resulted in a lot of wasted space. There are very cleverly engineered corner units that not only give you rectangular shelving but also swings them clear of the cabinet. This gives you optimum storage and very easy access. You can also get a drawer system that slides out from the corner and kidney shaped shelves that swing very easily from blind corners. In fact there is probably more corner hardware on the market now than any other type of storage solutions. Pullout pantries still remain popular because of their ability to display all your stored goods. A lot of designers are using smaller versions of these throughout the kitchen and even in over-cupboards to provide their clients with a good visual stock take. As over-cupboards regain popularity, drop down hardware from these grows. We are already seeing spice cupboards that sit nicely beneath over-cupboards and swing down to present to the cook their complete selection of spices at shoulder height. Good European design has produced some excellent kitchen recycling centres. Rubbish bins have been the last area to receive serious attention in NZ kitchen design. With the push for recycling well advanced now our kitchens should be geared for at least 2 separate bins. The recycling hardware now available allows the designer to specify rubbish bins that meet most clients' needs and work as smoothly as any other drawer system in the kitchen. There is now no excuse for the bucket in the bottom of the pantry or sink cupboard! There is a huge selection of kitchen hardware in New Zealand and many different companies marketing it. Like a lot of industries there are some Asian imported copies that appear to be a bargain but turn out to cost a lot more in replacements further down the track. It pays to take advice from a reputed designer or kitchen manufacturer to avoid these mistakes, but no matter what, check the warranties. A lot of the better importers will offer a life time warranty. Good hardware in your kitchen can “make or break it”. Whether you’re a spec’ builder or it’s your dream kitchen it is an area you should spend a little more on because the quality can be seen, heard and felt. It’s these 3 senses that will either sell your kitchen or make it a pleasure to be in.